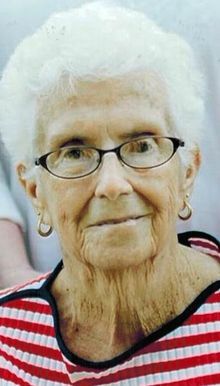 TAMPICO – Virginia Hicks Cole, 84 of rural Tampico died Sunday, February 14, 2016, at her home. She was born on March 29, 1931, in Crystal, West VA the daughter of Stephen and Tidie (Shilling) Becorest. She married Cecil Hicks on Aug 30, 1947, in Tazwell, West VA. He died in 1976. She later married Donald Cole on December 3, 1977, in Rock Falls, IL. He died in 2003. Virginia enjoyed collecting and antiquing; attending yard sales and mowing her lawn on her John Deere mower. Survivors include her daughter: Connie (Dallas) Branson of Rock Falls; her sons: Steve Hicks of Tampico and Kenny (Terri) Hicks of Colorado Springs, CO; three stepdaughters: Gail (Buster) Handcock of IL, Vicky (Greg) Nielsen of Tampico and Pam Cole of Grayslake, IL; four stepsons: Mike (Susan) Cole of MO, Donald Cole of Sterling, Steve (Wendy) Cole of NH and Danny Cole of Sterling; 24 grandchildren; 41 great-grandchildren and 2 great-great-grandchildren. She was preceded in death by a son, Robert Hicks; 2 sisters: Pauline Crowder and Mary Becorest; two brothers: Clarence and Nelson Becorest; a stepson Bob Cole; a stepdaughter Chris Tompkins; a grandson Brock Branson; and great-granddaughter Madison Fitzgerald. A gathering of friends and family will take place on Friday, February 19, 2016, from 4-6 PM at the McDonald Funeral Home, 505 1st Avenue in Sterling. A memorial service will follow at 6 PM. Private family burial will be at a later date at Oak Knoll Memorial Park, Sterling. Memorials to St. Jude Children's Research Hospital or Hospice of the Rock River Valley.